The 4 in 1 Slide Combo Bounce House is a great option for kids of a variety of ages! Whether you’re looking for a bounce house for preschoolers or 16 year-olds, this bouncy house can’t be beat. This bounce house rental is available for four hours, not including time for set-up and tear-down, and it requires a 20 x 20 space. If you plan to set up this bounce house in a park without a power outlet, you’ll need to use a generator to power it. The 4 in 1 Slide Combo Bounce House features a large bouncing area, a basketball hoop inside, an internal slide and climbing steps for the slide. It will keep children of all ages entertained for hours, all in one affordable package! 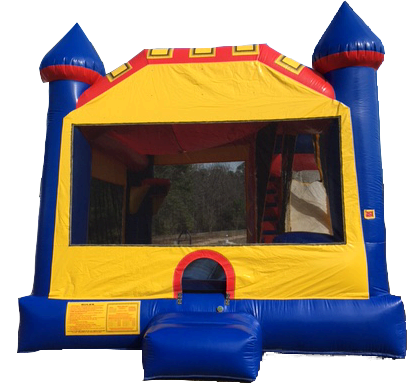 We recommend setting this bouncy house rental up on a 20 x 20 grassy area, but it can be set up on dirt, asphalt or concrete as well. Reserve this bouncy house for your next event today!